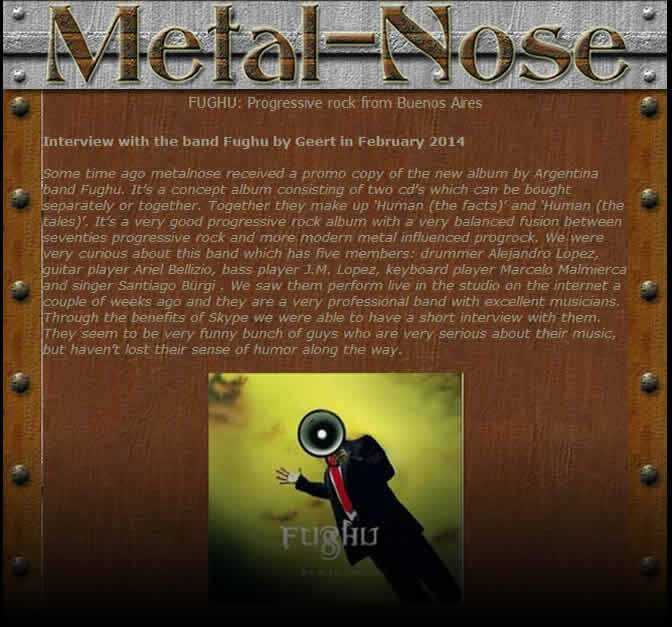 Some time ago metalnose received a promo copy of the new album by Argentina band Fughu. It’s a concept album consisting of two cd’s which can be bought separately or together. Together they make up ‘Human (the facts)’ and ‘Human (the tales)’. It’s a very good progressive rock album with a very balanced fusion between seventies progressive rock and more modern metal influenced progrock. We were very curious about this band which has five members: drummer Alejandro Lopez, guitar player Ariel Bellizio, bass player J.M. Lopez, keyboard player Marcelo Malmierca and singer Santiago Bürgi . We saw them perform live in the studio on the internet a couple of weeks ago and they are a very professional band with excellent musicians. Through the benefits of Skype we were able to have a short interview with them. They seem to be very funny bunch of guys who are very serious about their music, but haven’t lost their sense of humor along the way. You just released a second album ‘Human’, which is a concept album. What is the story behind it? ‘When we started to compose the album, we had more than a hundred demos by different members of the band. Each of us has his own influences and writes different kinds of stuff. We are open to each other’s ideas and we are very open to develop these different ideas into a song. You have some well known musicians like Jeff Kollman and Damian Wilson as guests on the album. How did they end up working with you guys? ‘Blackmail!!! (laughter). Ariel did have contact with Jeff Kollman on Facebook and told him about the album we were recording. Jeff was very open to collaborate and when he did hear a song he was immediately prepared to work with us and he wrote a great guitar solo. The first idea was to let him do a kind of duel with the keyboard player, but his solo was so great that we decided to keep it the way it was. As for Damien Wilson, we know someone who worked with him and who was trying to get us some concerts at European festivals. We asked that person to contact Damien and ask him if he would be prepared to do something with us. He showed interest, but after we send some material to Damien, we didn’t hear from him for a long time. In fact we had already given up hope when he contacted us again with a message that he liked our music very much and that he would gladly work with us. The singer of Fughu, Santiago Bürgi has a very good voice and sings almost like a classical singer. Is he a trained musician? ‘Yes, he is a very busy musician touring the world. He sang in China and Austria and does classical opera’s here in Argentina. He’s a professional, but first of all he’s a rock singer. He’s really a very funny guy with a rough attitude. Do you do a lot of live shows? ‘Well, last year we did a couple of shows in our area and this year we hope to do more shows all over the country. In the past we did a lot of acoustic shows, but the new album requires a big production and preparation. We will also need venues that are big enough to handle the stage production. We only played once outside of Argentina, but we are trying to set up something for Europe and Japan right now. It’s not an easy thing to do, because the traveling is very expensive. As an independent band, it is not simple because to make it work, we have to find enough places to play. Did you get some good response from Europe about the CD? ‘Yes we did and it was all great, except for one review in a prog magazine by the way (laughter). The guy compared Santiago’s voice with Fish (laughter)!!! It surely is, I personally ordered the first album ‘Absence’ with CdBaby and everything went smooth. It’s a great album by the way!